Before heading down to Arizona, I had some targets I was hoping to catch up with that I had missed on previous trips to the southwest. 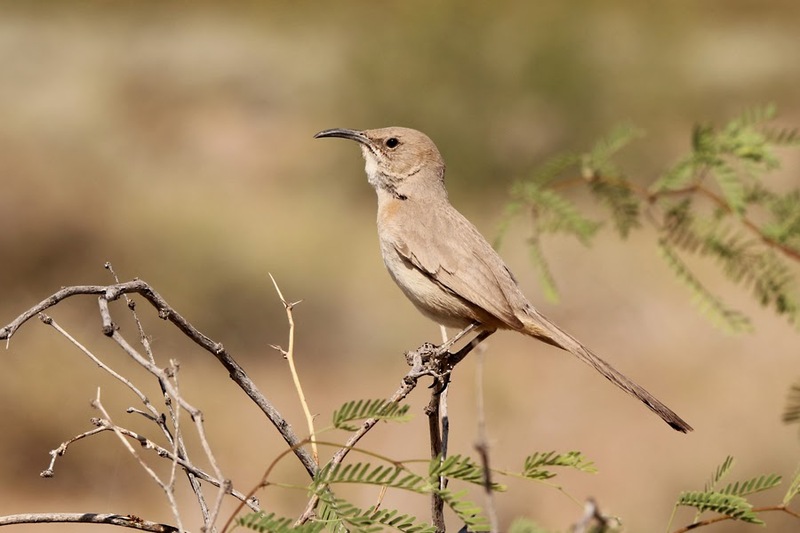 Bendire's Thrasher and Gilded Flicker were two such targets and I knew they were both denizens of the sparse Sonoran desert shrublands around Phoenix. I figured this would be a great way to kick off my trip because these two species would be harder to find as I ventured south into canyon country. If you've been down to Arizona and had Bendire's Thrasher as a target, I have a sneaking suspicion you know about the "Thrasher Spot" where Baseline Rd. meets the Salome Highway, approximately 15 kilometres west of Buckeye. If not, let's just say the title that has been bestowed upon this area is very apt. The "Thrasher Spot" was less than an hour's drive away from the airport in Phoenix, so after landing in the late afternoon on April 12 I picked up a rental car, grabbed some supplies, and headed west. It was well after dark when I arrived and I should have been tired, but I am always very excited about the prospects of new critters when I travel. 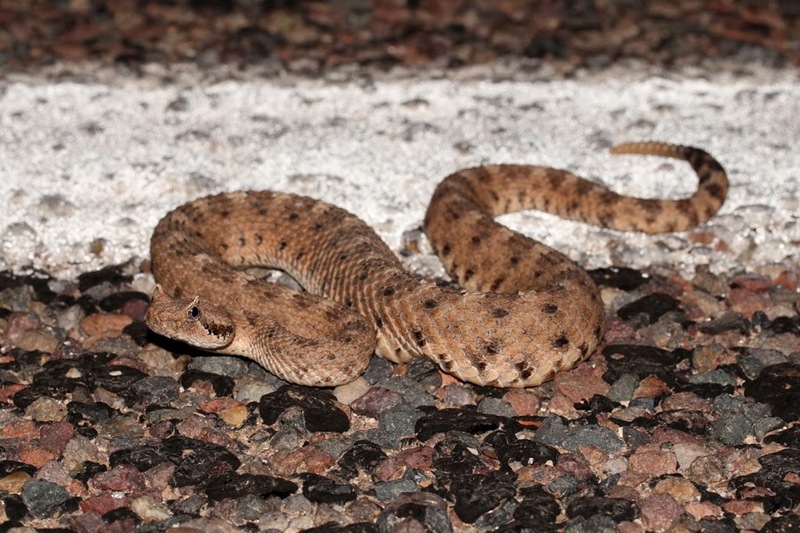 My plan was to sleep in the car, but I figured I should cruise the roads for a while looking for snakes and also scope out a good quiet spot to park for the night. It was fruitless for the first half hour, so I hopped out and set out on foot for a bit. Finally, I struck some form of pay dirt with a kangaroo rat! 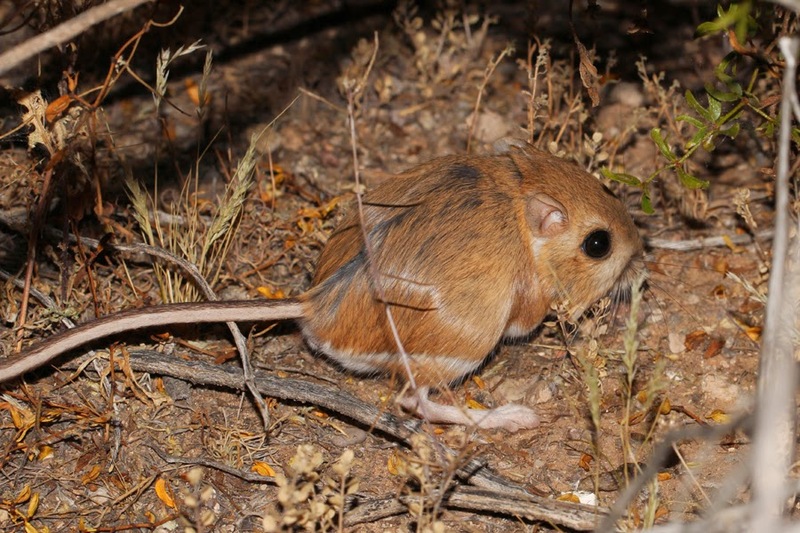 I managed to get quite close and snapped some photos that allowed identification: Merriam's Kangaroo Rat. The only other kangaroo rat I had seen before this was an Ord's Kangaroo Rat on a sagebrush plateau near Plush, Oregon. After my jaunt in the desert, I still wasn't tired so I continued cruising the roads for a while. Eventually this, too, payed off. As I drove along, I noticed a snake on the other side of the road. I quickly turned around and sprang in to action with my headlamp and camera. It was a rattlesnake! I took a couple quick record shots and then decided I wanted to try to move it off the edge of the road. I had nothing to do that with, though. I managed to get it to move a short ways just by stepping on the road as close as I felt comfortable doing so. When it moved, it was winding along sideways. Hmmm... what does that? Oh right... Sidewinder! I had a little photo session with it and in a way it reminded me of an Eyelash Viper. When I saw my first Eyelash Viper, the modified scales over the eyes - the "eyelashes" - were mind-blowing and I had to be mindful that I was dealing with a venomous snake and not let excitement obscure my judgement. 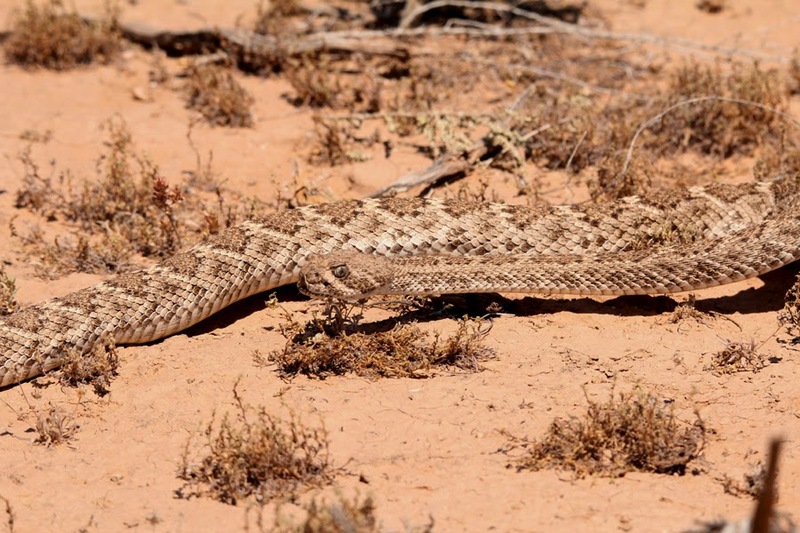 The Sidewinder also has scales above its eyes - the supraocular scales - that are raised and give a horned appearance, so it also sometimes called the Horned Rattlesnake. 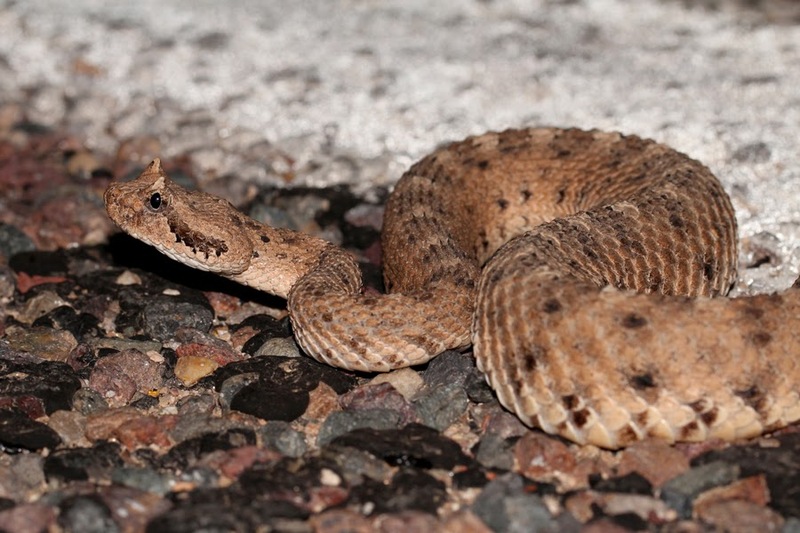 The venom on a Sidewinder is apparently mild as far as rattlesnakes go, but I still maintain a very healthy respect for any venomous snake. I enjoyed the Sidewinder at a safe distance and now you can safely view it in the comfort of your home. I didn't have any more sightings of interest that evening and I managed very little sleep that night. Regardless, when the sun's up and you're in a new place, you find energy. I am not sure why, but I opted not to start right at the "Thrasher Spot". I thought perhaps it was all good habitat, but that was not really the case. I still had a nice start to the day as I birded a little dry wash that had some lusher shrubs. 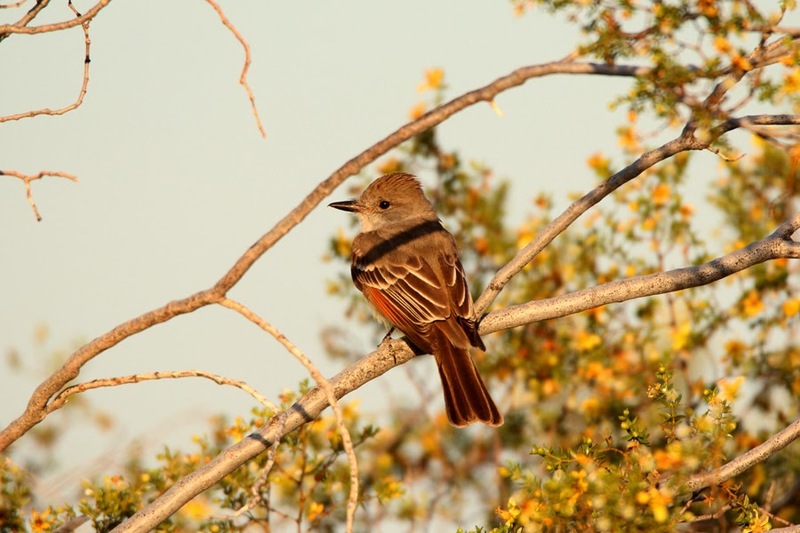 I quickly tallied some of the expected desert species, including Verdin, Abert's Towhee, Northern Mockingbird, Lucy's Warbler, Black-tailed Gnatcatcher, Gambel's Quail, and Ash-throated Flycatcher. The absence of thrashers in the first patch spurred me to head back to the car and make my way back around to the proper "Thrasher Spot". 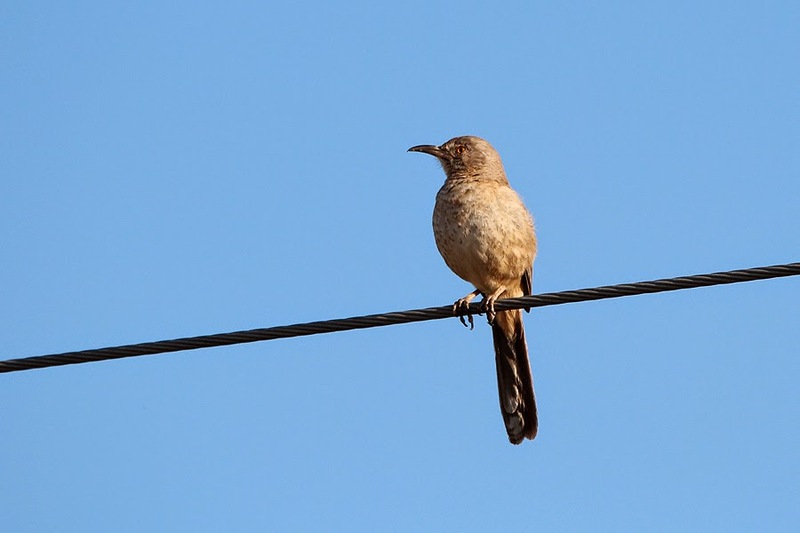 I was scanning fence posts and powerlines along the way and I was rewarded with a thrasher on a wire. At this point, I should point out that I really should have gone somewhere to see Curve-billed Thrashers first because I thought I was looking at a Curve-billed Thrasher. It's a bit of a spoiler, but I wasn't even sure I had seen a Bendire's here. 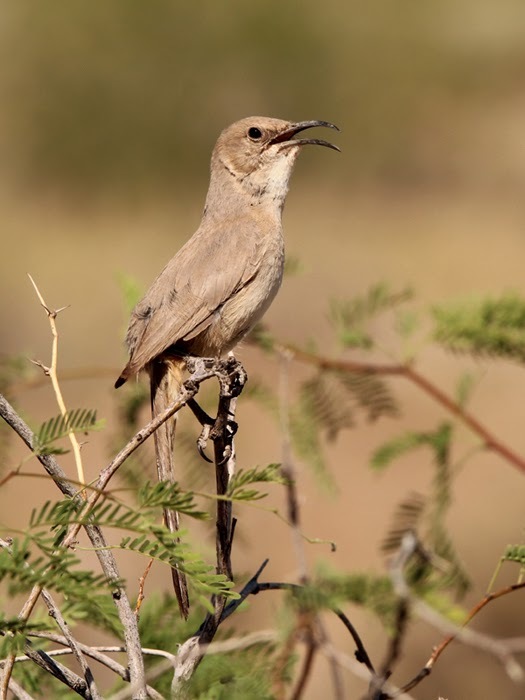 It wasn't until I saw my first Curve-billed Thrashers elsewhere that I had a feeling I was looking at Bendire's at the "Thrasher Spot". 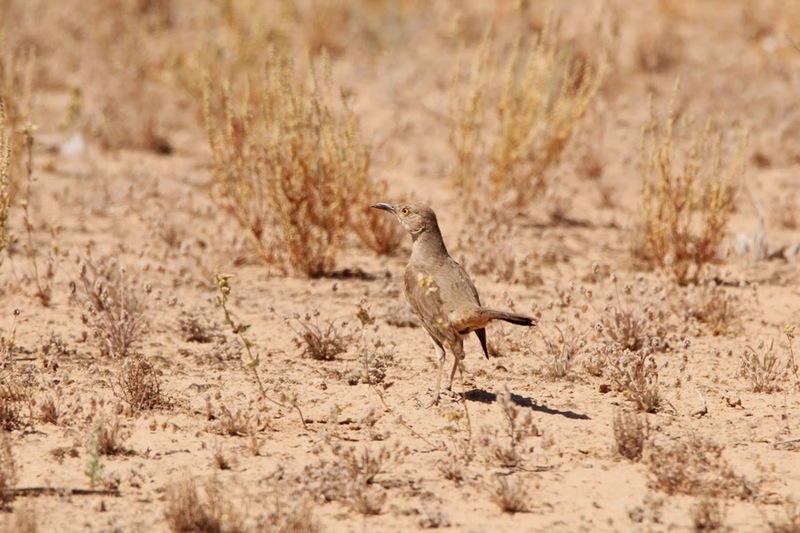 Rich Hoyer confirmed this for me later by saying "There are no Curve-billed Thrashers there." I have a much better eye for it now and you can even see the fine streaking on the chest of the very first one I saw on the wire. The shorter, straighter bill now looks very obvious to me on this Bendire's Thrasher, and those fine streaks can be a little inconspicuous but they're showing well on this one. In behind the thrasher, I heard the call of a flicker. I managed to track down the source sitting on the top of a power pole. The flicker had a very plain tan head and then it flew right over me to reveal yellow on the flight feathers: Gilded Flicker! So, although I didn't know it at the time, I had both of my targets knocked down very quickly! I watched the flicker land on a distant saguaro cactus, so I beelined across the desert to get to it. Along the way, I was momentarily distracted by a blob near a shrub. I glassed it and was surprised to see it was a Great Horned Owl. The flicker was my target, though, so I continued making my way towards the big saguaro it had landed on. I was still a fair distance away when it flew, but it went right by me again so I had great looks as it passed over. Back to the Great Horned Owl... but where did it go? I could see an American Kestrel diving at something just on the other side of a small rise, so I started to head over in that direction. Then I saw the most amazing sight. I'll just show this one because words won't do it justice. This was quite the sight for this Pacific Northwest lad! 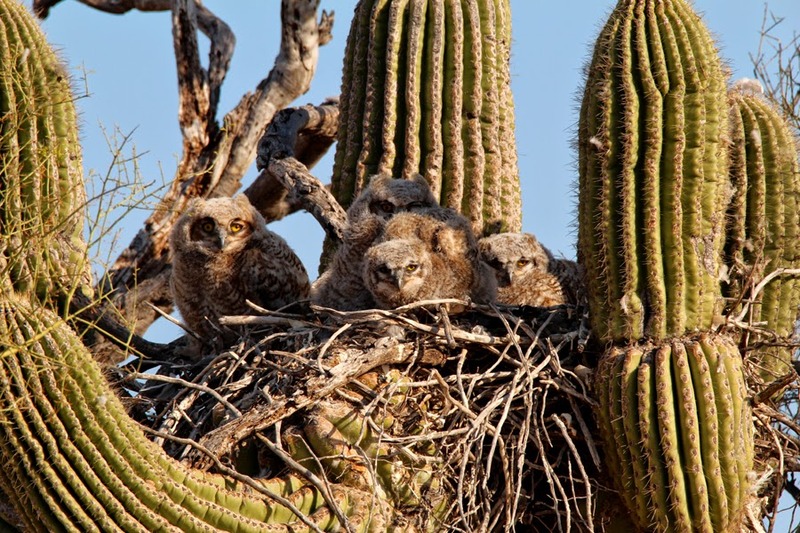 I am used to seeing Great Horned Owls nesting in a snapped off Douglas-fir snag, so seeing a large stick nest resting the fork of a saguaro with four owlets under the Arizona sun was amazing. I made my way back to the car and started driving again and it wasn't long until I was pulled right back over to the side. This time it was Cactus Wrens that had my interest. I had a family group near a tall saguaro and enjoy watching them creep around the trunk and investigate holes and so on. 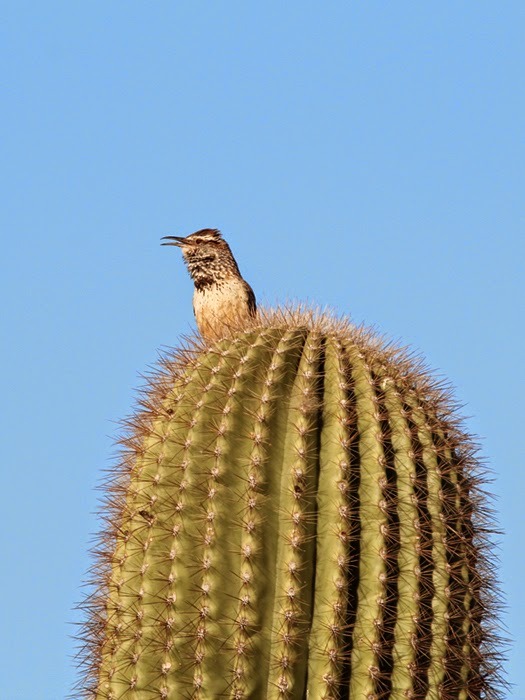 I like having two senses firing, so the male singing on top of the cactus was great. After the first couple of birding in areas near the "Thrasher Spot", I decided to see what the hype was all about. I made my way to the intersection of Baseline Rd. and the Salome Highway and found a little pull-off. 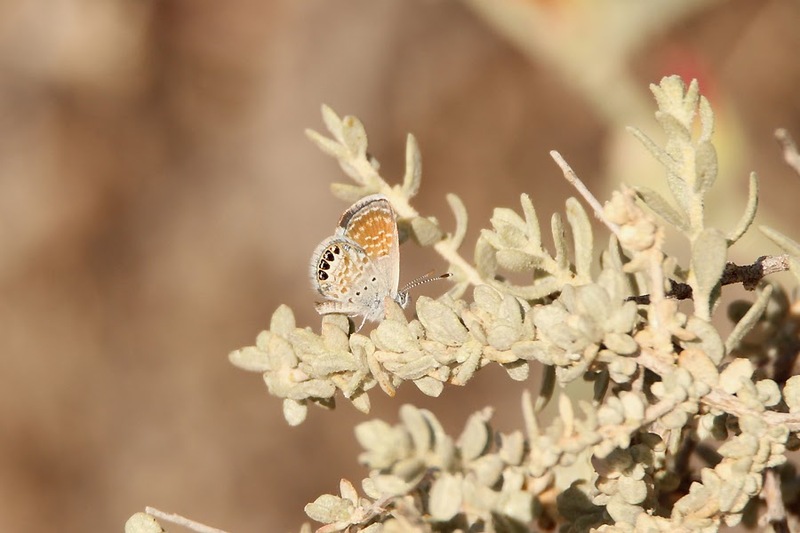 I spent the next couple of hours walking around the sparse shrubby flats and checking thickets for anything that moved. I'll hold off on the birds and start this off with some non-feathered critters. 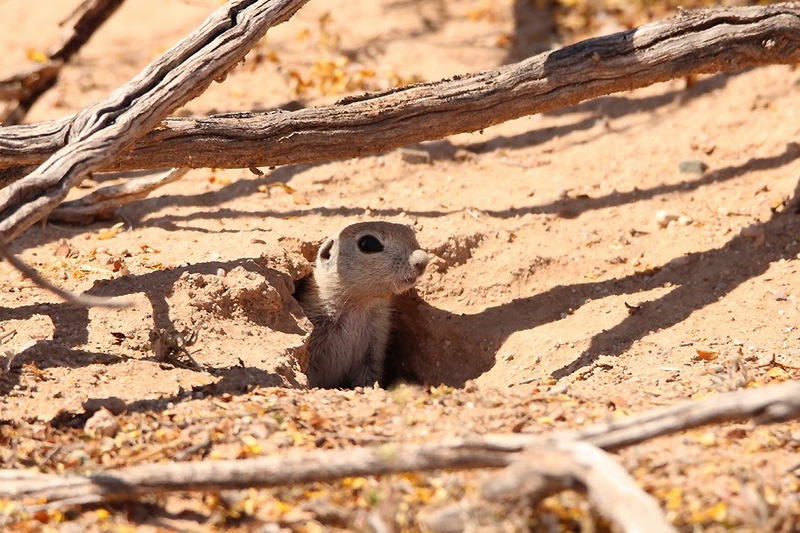 It took me a while to find the source of the hitch-pitched call I kept hearing - turns out it was a Round-tailed Ground-Squirrel! What would a section on the "Thrasher Spot" be without highlighting the thrashers? I unfortunately didn't come across any Crissal Thrashers there, but I had crippling views of LeConte's Thrashers! 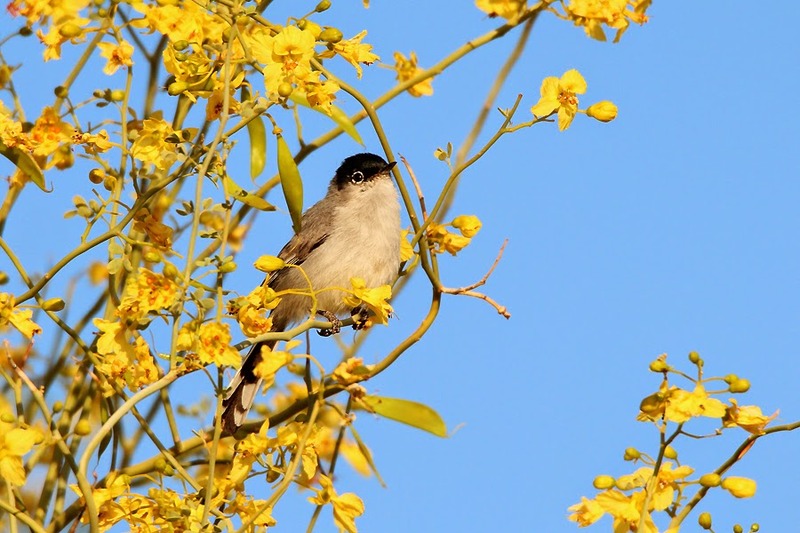 I spent about five minutes standing approximately five metres away from one singing on a shrub. I slowly shuffled my way up to it and it wasn't phased in the slightest. 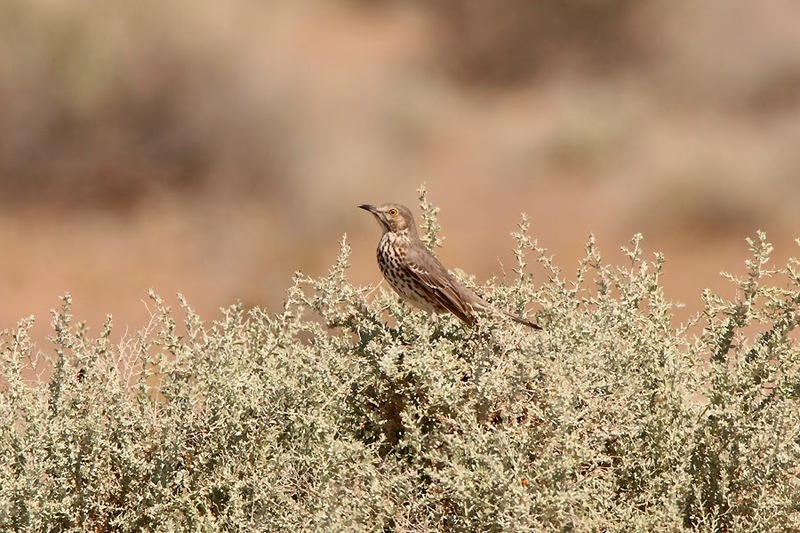 I also got to see them do their roadrunner-like dashes between shrubs! I've picked a couple shots of the very cooperative one to share here. For a bird a lot of people say is hard to see well, I wasn't going to complain! I did find a pair of Bendire's Thrashers here that were feeding a young one. They were actively running on the ground and snapping up insects. Here is a shot of one that momentarily paused in between forays. I may have missed Crissal Thrasher, but I was surprised to find a relatively late Sage Thrasher. I worked hard to get some shots of it and the results are not too bad. Starting my first day at the "Thrasher Spot" near Buckeye was indeed a grand kick-off to my travels in Arizona. 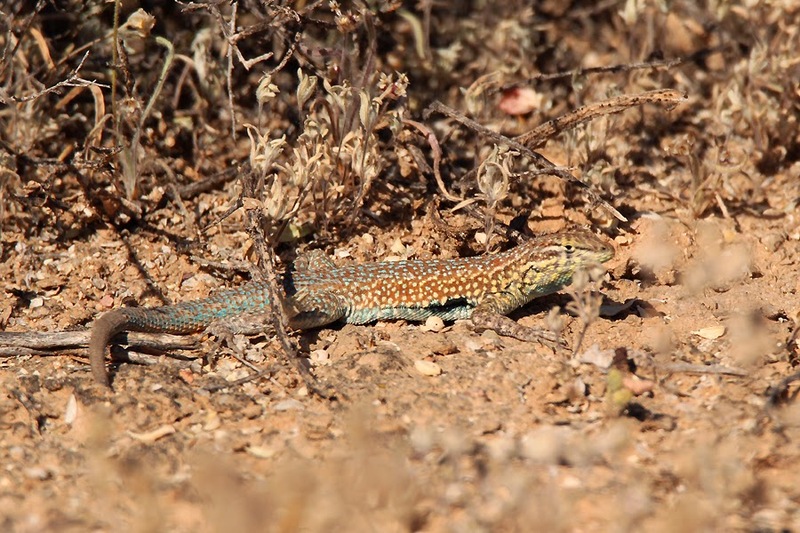 I had two lifers under my belt and had refamiliarized myself with some of the ever-present birds of the arid environments I would be spending the next week touring around. I live on the Saanich Peninsula on southern Vancouver Island in British Columbia. When I was young, my dad got me hooked on birdwatching and the hobby has yet to lose its lustre. In fact, my passion for birds gradually evolved into an appreciation for all things natural. Through fellow naturalists, work, and my own inquisitive, restless mind, I started to learn about plants, mammals, dragonflies, butterflies, reptiles, amphibians, terrestrial molluscs, tiger beetles, moths, fungi, and anything else that catches my eye.